"Healthy and tasty vegetarian dish. 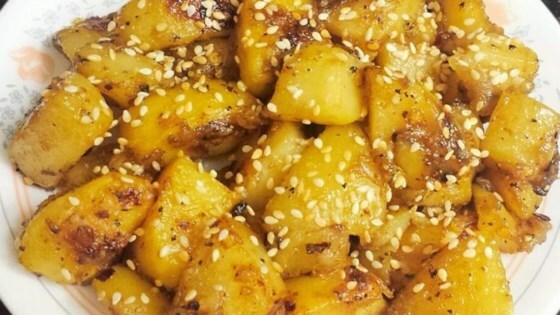 Garnish with additional sesame seeds before serving." Place a steamer insert into a saucepan and fill with water to just below the bottom of the steamer. Bring water to a boil. Add potatoes, cover, and steam until easily pierced with a knife, 30 to 35 minutes. Drain and cool until easily handled, about 15 minutes. Peel and dice potatoes into 1-inch cubes. Spread on baking sheet. Bake in the preheated oven until lightly golden, 15 to 20 minutes. Grind garlic, black pepper, basil leaves, and cumin seeds into a paste with a mortar and pestle. Heat oil in a large saucepan over medium heat. Add garlic paste and red chile pepper; cook and stir until garlic begins to brown, 1 to 2 minutes. Stir in potatoes and lemon juice. Cover and cook until flavors combine, about 5 minutes. Stir in orange sauce and sesame seeds. Use a spice grinder instead of a mortar and pestle in step 5 if desired.